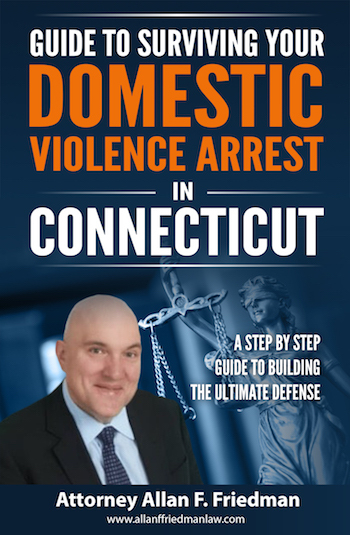 Top Stamford criminal defense lawyers would agree that domestic violence crimes are treated very seriously by Connecticut State’s Attorney’s and Courts. Resolving even a minor domestic violence case can require numerous trips to Court, the imposition of criminal orders of protection and the possibility of having to engage in Court ordered classes. Any criminal case is a stressful and frightening experience to go through but domestic violence matters have the added dimension of possible separation from your family and loved ones while the case is pending. If you have been arrested for a domestic violence crime, or if you are under police investigation regarding a domestic violence incident, it is imperative that you retain the services of an aggressive and experienced Stamford domestic violence defense attorney. Stamford criminal defense lawyer Allan F. Friedman has 25 years of experience defending domestic violence accusations in Fairfield County and throughout the State of Connecticut. Attorney Friedman’s objective in handling domestic violence cases is to obtain the best possible result for his clients, and have charges dismissed or reduced when possible, while working to bring families together. Do the Police Have to Make an Arrest If My Partner Doesn’t Want to “Press Charges”? Can the Victim Get the State’s Attorney to “Drop the Charges”? If the Victim Did Not Want a Criminal Order of Protection Issued or Wants the Current Order Modified – What Can Be Done? Can a Victim Give Permission to Modify or Change a Criminal Order of Protection? Is It Possible to Have the Conditions of Release Modified? What Are My Chances of Serving Jail Time for a Domestic Violence Charge? What Is the Best Course of Action If I Am Arrested for a Domestic Violence Crime? Q. Do the Police Have to Make an Arrest If My Partner Doesn’t Want to “Press Charges”? A. The best Stamford criminal defense lawyers will tell you that Connecticut has a mandatory dual arrest statute. This means that Police are required by law to make an arrest anytime they are called to investigate a domestic violence offense if they find probable cause that a crime was committed. So even if the victim does not want to cooperate and says that they do not want to press charges or make any statement the Police will still make arrests if they have evidence of a crime taking place, such as statements from neighbors or witnesses. Q. Can the Victim Get the State’s Attorney to “Drop the Charges”? A. No. Lots of people mistakenly think that if the victim of the crime does not want to go forward with the case they have the power to “drop the charges.” In the area of domestic violence it is very common for victims who have been repeatedly abused many times by the same person to come to Court and request that the charges be dropped so that they can reconcile with the alleged abuser. State’s Attorneys are not going to go along with these requests because the Courts have concerns for the safety of victims and what will happen if criminal orders of protection are lifted or vacated. For this reason State’s Attorneys are usually unwilling to take action on such requests. The State of Connecticut is the entity which is prosecuting the case on behalf of the people of the State. While the victim’s input in accordance with our State Constitution must be considered in any resolution of a criminal case, the State’s Attorney is never going to drop or nolle a case upon the request of the victim unless the facts of the case warrant it and until the State is assured that the situation is safe for the victim. If you are the victim of a domestic violence crime are and you are not getting the answers you want you should consider retaining the services of a Stamford domestic violence defense attorney to advocate on your behalf in Court. Call today for a free consultation. Q. If the Victim Did Not Want a Criminal Order of Protection Issued or Wants the Current Order Modified – What Can Be Done? A. At a domestic violence arraignment which takes place the next business day after a domestic violence arrest the Court will impose criminal orders of protection in favor of the victim. Often victims will come to Court and inform family relations that they do not want any orders of protection and want to continue to live with the accused. The Courts are more concerned with protecting victims of domestic violence and providing a “cooling off” period than accommodating the desires of victims. The victim does not decide what level of order of protection will be entered by the Court the office of family relations usually makes the initial decision based upon a screening of the parties and a review of the facts of the case. Once a criminal order of protection has been issued you can apply to have it modified, however, you need to go about it the right way and have a good argument to convince the Court why the order of protection should be modified. If you want to modify a criminal order of protection you should seek the advice and counsel of an experienced Stamford criminal defense attorney. Q. Can a Victim Give Permission to Modify or Change a Criminal Order of Protection? A. No. No matter what the victim tells you can not violate the terms of a criminal order of protection. Very often people are confused because they feel that when a no contact order has been issued it is “ok” if the victim is contacting them. This is not correct. Under the law if there is a no contact order you can’t have any interaction with the victim regardless of who initiated the contact. The violation of a criminal order of protection is a class D felony punishable by up to 5 years in jail. Only a Court can modify the terms of a criminal order of protection once it is in effect. If you want to have the terms of an order of protection modified you should seek the services of an experienced Stamford domestic violence defense lawyer. Q. Is It Possible to Have the Conditions of Release Modified? A. If you have a domestic violence case pending and the Court has imposed restrictive conditions of release which require you to attend classes and meetings which conflict with your work schedule and are unduly burdensome it is possible to get the requirements modified. If you have private health insurance or can afford to pay out of pocket for treatment with a private therapist usually you can substitute the Court ordered treatment programs with private counseling which can be a lot more convenient and flexible. Q. What Are My Chances of Serving Jail Time for a Domestic Violence Charge? A. Unless there is a serious injury involved or multiple violations of a criminal order of protection 99% of domestic violence cases are usually resolved without the imposition of any jail sentence. This does not mean that you could not face the possibility of a criminal conviction which could significantly impact your future employment prospects or have adverse immigration consequences. Also, restrictive and lengthy periods of probation are also a possibility. You should treat every allegation of domestic violence seriously as the State will zealously prosecute every case. Q. What Is the Best Course of Action If I Am Arrested for a Domestic Violence Crime? A. The most important thing you can do to help your case is to remain silent. You have the right to refuse to answer questions from the Police and also from the office of family relations. In many cases the admissions of the accused are some of the most powerful evidence that the State’s Attorney has against you so don’t help them make their case and maintain your silence. Let your attorney do any talking for you. Another important thing you can do is to carefully document any evidence of any injuries that you or the victim sustained while you can with your camera equipped smart phone. Very often this kind of evidence can be invaluable. When dealing with the Police always remain professional, polite and cooperate but insistent on your right to have a Stamford criminal defense lawyer present before you have to answer any questions. Let Us Defend Your Domestic Violence Case! We provide free initial consultations. We have 25 years of Court room experience throughout the State of Connecticut. We will discuss your goals of the representation which are usually a dismissal or a reduction of the charges and any special concerns that you may have . Often working with an experienced Stamford domestic violence attorney can have a significant impact upon the outcome in your case. If you have been arrested for a domestic violence crime in Fairfield County do not hesitate to contact the Law Offices of Allan F. Friedman. We work on a flat fee basis and our rates are reasonable. We offer payments plans as needed. Call Attorney Friedman at 203.515.4110 to schedule your free initial consultation we are available 24/7. Or you can contact us online for a prompt response.